First Look at Lupin III Live-Action Movie Actor in Costume? Maybe! There's a live-action Lupin the Third movie being made in Japan. Master thief Lupin is being played by Japanese actor Shun Oguri. Here's what is being called the first look at him in costume. The image surfaced on 2ch, Japan's largest forum, and looks to originally be from a Chinese social networking site. It might be fake! Or it might simply be Oguri in a Lupin-esque outfit. However, as Japanese site Sponichi Annex reports, filming for the picture began in Thailand on October 3. There are a couple reasons to assume this is the actor in his Lupin costume. One is the yellow tie Lupin often wears. Another are the thin slacks pulled up high, Lupin style. 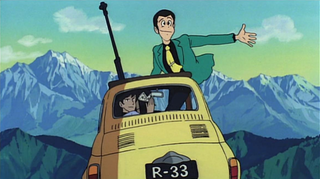 Below, you can see an image of the character in Lupin the Third: Castle of Cagliostro, the classic anime directed by Hayao Miyazaki of My Neighbor Totoro fame. Online in Japan, some 2ch users are saying that Oguri, who lost nearly 18 pounds for the role, nails the look of Lupin. Others said it just looked like cosplay. I say it's kind of hard to tell!